When we learned that the final arc of Kokoro Connect was going to be cordoned off to be released at a later time, it left a sour taste in the mouths of us loyal fans here at the Glorio Blog. Poised to be one of our favorite shows of the year, the lack of conclusion made us have to reevaluate it at the breaking point, and ultimately label it incomplete and unsatisfying. Now that this last arc has been released, will it be everything we hoped for? 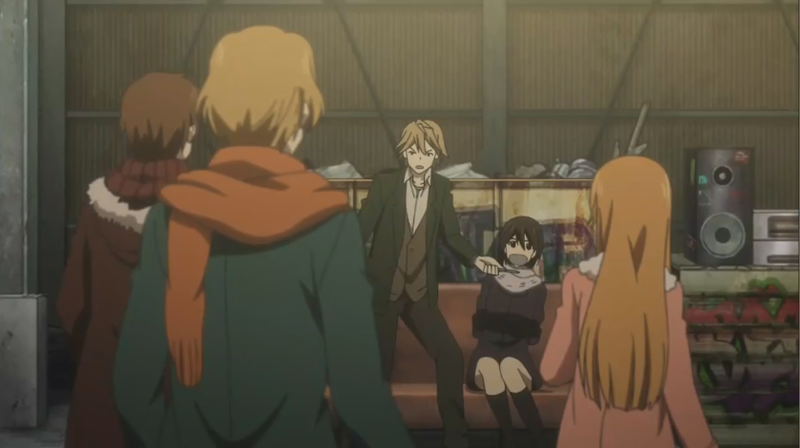 Read on as we look at Kokoro Connect Episodes 14, 15, 16, and 17, the Michi Random arc. 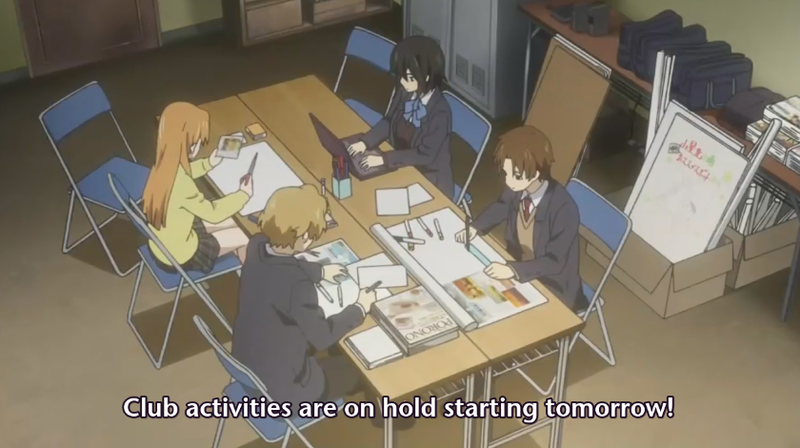 Marlin’s Final Impressions: We’ve waited a long time for Kokoro Connect to come out with this final arc of the anime’s story, and man was I not disappointed. As hinted by the last moments of episode 13 before it went off air, the final arc puts to rest the love triangle between Iori, Taichi, and Inaba which appeared in the arc. This really was the show in its prime. The writing was brilliant, the drama was intense, and the new phenomenon was absolutely dastardly. As predicted by some, Heartseed returns with the most devestating phenomenon, basically a kind of unwilling telepathy called “emotion transmission. As the one who hides her emotions the most, this phenomenon most swiftly affects Iori. It’s been hinted at since the beginning, but now we finally learn that her cheerful demeanor is a complete facade, hiding a girl that has been too afraid to live for herself from a very young age. Drama in the love triangle escalates quickly, as in medias res we find Iori rejecting Taichi’s feelings, believing that he doesn’t love her for her true self, only the one she shows everyone that she believes is fake. Adding to the problems, they have to fight to keep their adviser/possession vessel Go-san. 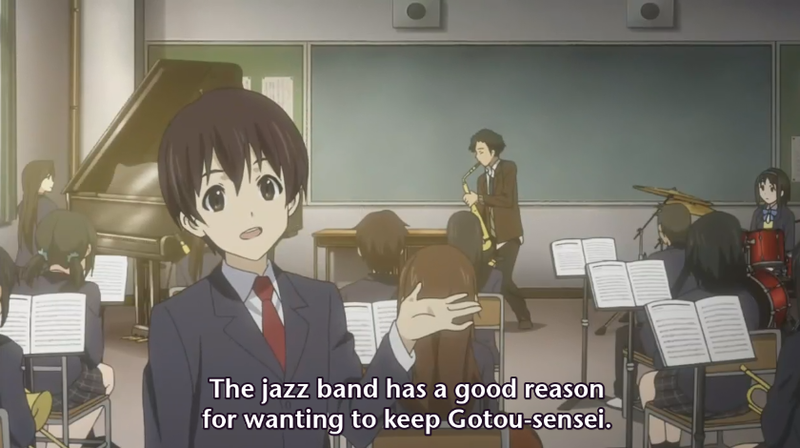 Personally I actually found it hard to root for them, seeing as Go-san is actually a professionally trained saxophonist and their club barely does anything to begin with. This development was pretty entertaining, especially since prior to this problem we’d never even seen any of the actual work this club purported to do. It was fun seeing them work hard when it mattered, but soon became depressing as even though work was being done, they weren’t complete. Without Iori, it just wasn’t the same. It was heartbreaking watching as each character tries to reach out to Iori, only to have their misguided good intentions only further make her believe they didnt know her. It was almost funny how quixotic Aoki’s feelings were, but they had a charm that really made it seem like even just feeling them helped the group not succumb to despair. In the end, the biggest piece of drama was the love triangle. Iori had many valid thoughts to share against Inaba. Her actions really were unfair, encouraging Iori for so long only to turn herself into direct competition to the feelings she helped nurture in Iori. When it seems like there’s no way to bring her back, Taichi comes up with another speech that slowly brings her out of her funk. Iori has to live for herself. She’s the only one that can properly decide what that means. It also means she can’t just become completely depressed just because people have an idea of her that isn’t true. People always have their ideas of how people should act but for the most part it’s really none of their business. Looking back on these screens I grabbed, there was a lot of subpar quality animation and that was kinda disappointing considering this was released a full season after the actual show ended. This is more a fault of the writing but I also found he Inaba kidnapping scene weird as it seemed out of place and somewhat surreal in juxtaposition with all the interpersonal drama. The final chit-chat between Iori and Taichi also was pretty weird, kinda hand-waved in the conversation as being an effect of emotion transmission, but its not a big enough problem that it bugged me. In the end, Tachi realizes his feelings, us Inaba fans get our wish, and a proper finale is capped for a series I now deem to be a complete classic. Lifesong’s Final Impressions: I absolutely fell in love with this cast of characters back in summer. The existential pondering made this into something of a classic for me. That said, Kokoro Connect’s original TV ending left myself and many others wanting. The love way the love triangle was left open would be the easiest thing to point out, but many of the existential themes of the story were also left unresolved. These final four episodes managed to bring those themes to a satisfying close. I am an unrepentant fanboy of both Inaba and her actress Miyuki Sawashiro, so I am a bit biased in my feelings about this anime, or maybe I should say this is one anime where I became easily invested. Listening to Inaba’s somewhat accidental telepathic confession more than made up for the long wait. Some of the moments in these last few episodes were a lot of fun. Inaba’s recounting of her early morning fantasies proved that show still had some great humor left in store for us. 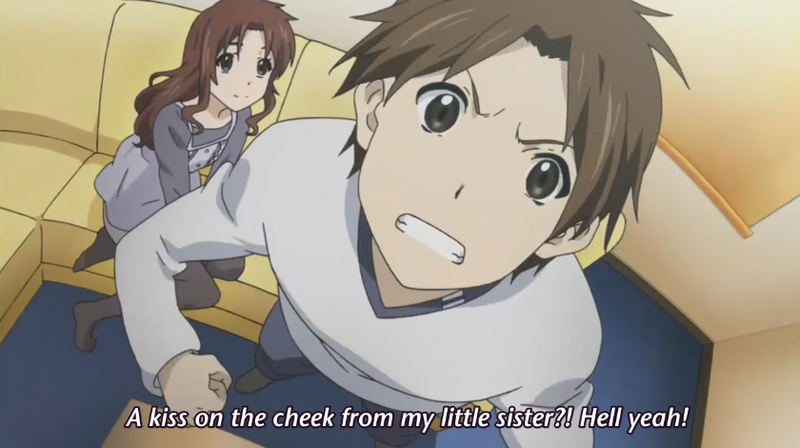 Another hilarious moment was watching freak out over the chocolate his imouto gave him for valentines day. In the end, what I really appreciate most out of these final few episodes is in the way the themes of the story meet their conclusion. Inaba who spent a large portion of the anime unable to accept those around her has defeated that which held her back. The way she winds up with Taichi in the end is significant both for the plot of the story, and her own existential theme inside the story up this point. Iori finally gets past her own fake self image and learns to let herself grow in a way that is true to her own desires. As someone who was home schooled these school drama stories lack a certain sense of nostalgia that I think they might have for a lot of other people. 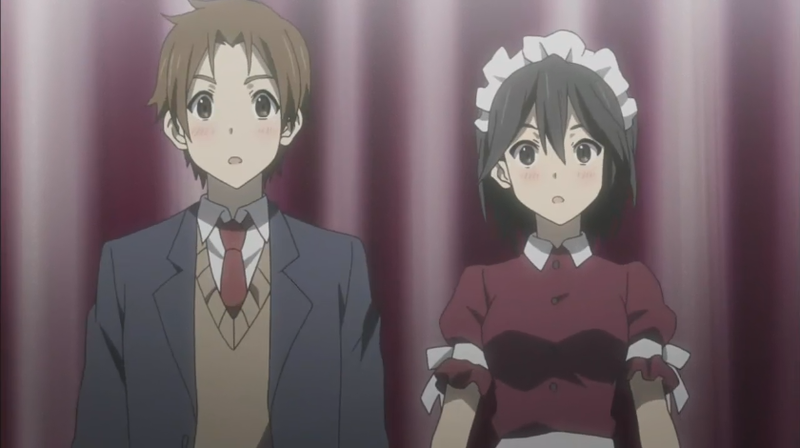 The school setting of Kokoro Connect is 100% fantasy for me, and yet oddly enough it is perhaps the one anime that constantly reminded me of own relationship with me first girlfriend. Perhaps because of that I never expected Iori and Taichi to work out and I am not entirely sure how well that inevitability was actually established, but I absolutely loved the way it all worked out either way. Personally this is one anime I am hoping to see get a western disk release as I want to put it on my shelf and share it with friends and family. This is a statement I see lot and I find it interesting, and I’m trying to grasp why. Is it because of the oddity that a bunch of normal students were able to hire a bunch of delinquents to trash their stuff and got overheard by Inaba? 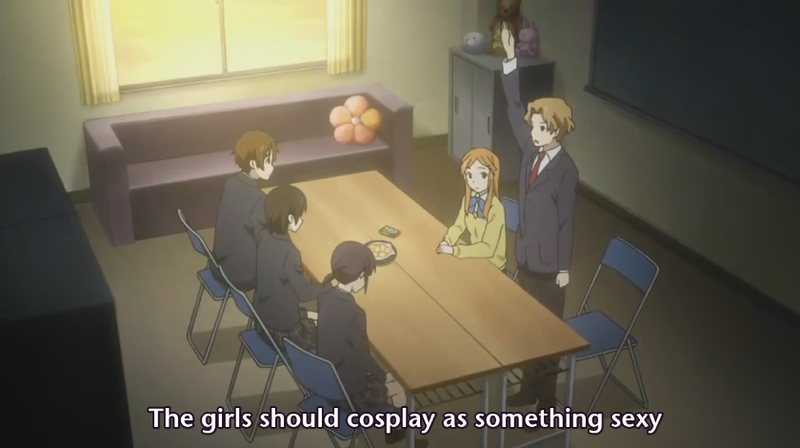 Would it ease that awkwardness if those bullying girls were… in fact, delinquents themselves? This is actually the LN setting (Setouchi was known in the class for hanging out with delinquents), and I never had much problem with the kidnapping when I was reading. In fact, the bullying and kidnapping LN was a lot more violent. For some reason it took me a few watch to realize that they left out that little detail in the anime. So I was wondering whether that caused the inconsistency. The kidnapping felt like it fit perfectly fine to me. I see that complaint going around a lot, but all I can do is scratch my head personally. I have not read the books, but just the fact that Setouchi’s hair was orange should have been enough to tip people off. I can’t help but feel like this complaint exists because westerners have failed to notice something obvious to the Japanese viewership. I think the kidnapping felt weird because other than Heartseed’s phenomenon, the school setting and the way the characters behave is very realistic. Yes, bullying is very common, but kidnapping at knife point (despite what anime tells you) is not. So I don’t think it’s a case of not figuring out there were delinquents involved, it’s seeing an unrealistic situation in the middle of a fairly realistic setting that seems odd. Anyone that sees that as more than a minor detail though is just nitpicking. There was clearly going to be some kind of confrontation, so even if they went a little overboard the point of the scene would have been the same. It’s not much of an issue and as a whole I think the final arc was well done. I think it was plenty realistic myself. I think people may be looking for it to be reasonable. 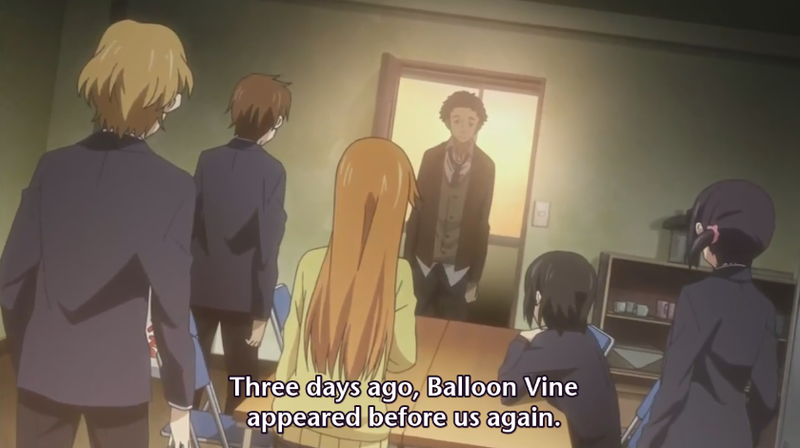 Was it reasonable for them to kidnap Inaba? maybe not, but I don’t think it needed to be reasonable to be realistic in this case. Delinquents do stupid things, in this anime we saw exactly that. I’m just not sure where their minds went from being caught for minor destruction of property to kidnap the person who found out. I’m not making a huge deal about it I just thought it was strange and nonsensical even to a lesser person’s reasoning abilities. Finally finished this series. Picked it up on a whim with no expectations and was completely flummoxed by the quality. Hidden gem of 2012. The last 4 episodes add so much. Shin Onuma is one of my favorite directors. Kokoro and Dusk Maiden were both great. I hope to see him doing more soon. I guess he is directing this new Ilya anime next season but it’s hard to get too excited for that. Yeah, it seems like all of my best shows are the ones I get randomly assigned. I went into Kokoro not knowing what to expect, but only a few episodes in I could realize it was something special. It’s this show that finally got me to realize why Life’s so crazy about Sawashiro. Gotta agree with him on those last four episodes too. They really extend that show from something good to a show I’ll remember for years to come.